I bet you thought my watercolor flowers series was done, didn’t you? I think I have a few more left in me! I don’t know if you like Google as much as I do. What did we do before it? 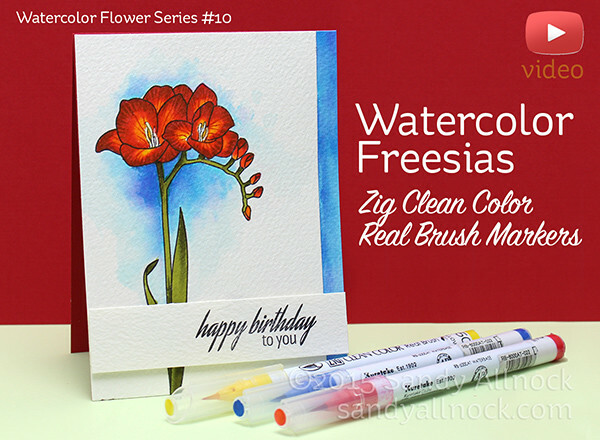 I wanted to know what color Freesias were when I got this stamp set – and there are SO many! And the red and yellow one was by far the one that caught my eye. So that’s what I used for coloring today’s flowers – and I included a trick I found for those colors that just don’t like to break down with water. It’s a pretty slick tip that can work with lots of markers! Watch the video below, or click HERE to see it in HD on YouTube. The colors used on my flowers: Blue 032 for the background, Green 043 and 046 for the leaves, Red 022 and 024 plus Yellows 050 and 052 for the flowers. Clickable links in the supply list below if that helps you! Coming tomorrow on Periscope…hope you can come on by! Paper choices: My favorite and the one used here is Arches Rough —- Canson XL is student grade but works good too! Absolutely GORGEOUS! I love these tutorials because I absolutely love these Zig pens. Thanks for sharing your technique. Beautiful! Thanks for sharing the tip about the dipping sraight into water, what an amazing pen! These freesias just stunning in rich red! Christmassy! Beautiful job! I love those watercolor markers. Their colors are so vivid! Beautiful results, Sandy! 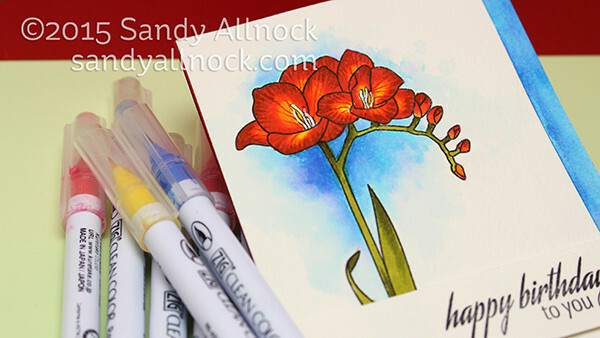 I just love freesia – I can almost smell their sweet scent when I look at your card. Delightful! So beautiful. Love to see you coloring. Hi Sandy. This card is absolutely STUNNING! Such beautiful work! Awesome card. It looks to soft and vibrant at the same time. Thanks for the tip, Sandy. I’m going to try this now that I see how well it works. Jeanne J. Smiled at your comment! I hope you’re never done with your watercolor series. I love it! The card is gorgeous. I’ve been on the fence about buying those markers, but I’m starting to lean toward getting them now! Beautiful! I always enjoy watching your videos. Very inspiring. The colors you used for this are really striking. It’s always nice to see such a beautifully rendered work.